The Carpentry program at the Charles H. Bohlen, Jr. Technical Center is winding down its latest project and is now looking for its next big project for the coming school year. Work on the two family duplex is nearing completion. This has been one of the more unique projects for the program due to its size, as it is slightly bigger than past modular homes built by the program, but the experience has been a positive one for the students involved. The owner of the duplex is James Davis. The retired Ft. Drum soldier plans on using the building as rental property in Black River. He credits the Carpentry students for their hard work and is pleased with how the project is coming along. The buyer of the building only has to pay for material costs and other expenses. Typically, it is around the $40,000 range. There are no labor costs involved as BOCES students use the opportunity to learn valuable skills. 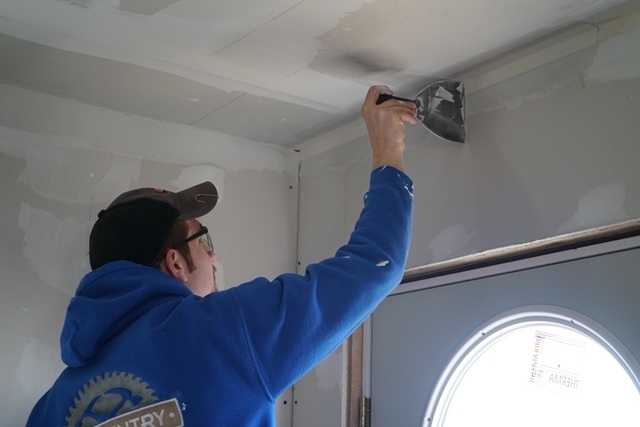 Students in the Electrical Wiring and Heating, Ventilation, and Air Conditioning programs all contribute to the house construction as well as Carpentry students. “It was a good experience coming here and learning about how a house is built,” says Jacob Thompson, a senior from Thousand Islands. Both Seth and Jacob say they plan on attending Jefferson Community College following their graduation in June. Davis says those who are interested in having a modular home built should look into the BOCES Carpentry program. Those who are interested in having the BOCES construction programs build a modular home should contact the Career and Technical Education Department at (315) 779-7200.